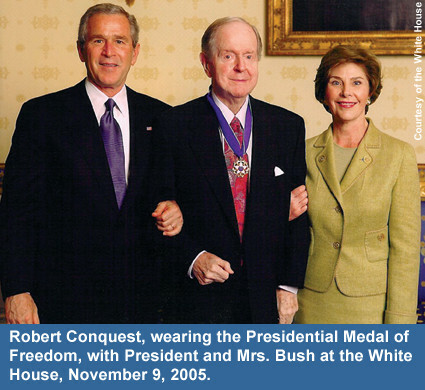 In the White House this past November 9—16 years to the day after the fall of the Berlin Wall—President Bush awarded the Medal of Freedom to Hoover fellow Robert Conquest. Herewith the president’s remarks, followed by the medal citation. the president: The Presidential Medal of Freedom is America’s highest civil award and is presented for meritorious achievement in public service, in science, the arts, education, athletics, business, and other fields of endeavor. The award was created through the executive order of President John F. Kennedy and first presented here in the White House by President Lyndon B. Johnson. All who receive the Medal of Freedom can know that they have a special place in the life of our country and have earned the respect and affection of the American people. . . . The conflicts of this young century demand a clear-eyed understanding of the great dramas and tragedies of the twentieth century. And perhaps no scholar has studied that time with as much diligence or intellectual courage as Robert Conquest. His life began in 1917, the year of the Russian Revolution, whose evil consequences he would so thoroughly and faithfully detail in The Great Terror and other memorable writings. The truths he told were not always in fashion. But the cautionary lessons he taught about murderous ideologies and the men who served them will always be relevant. His books have been translated into 20 languages, and there have been times and places when those books were carefully hidden. Today, the empire he revealed is gone forever, and the works of Robert Conquest are an enduring testament of the truth. This wise and eloquent man is greatly admired by his fellow Americans—and by all who love freedom.